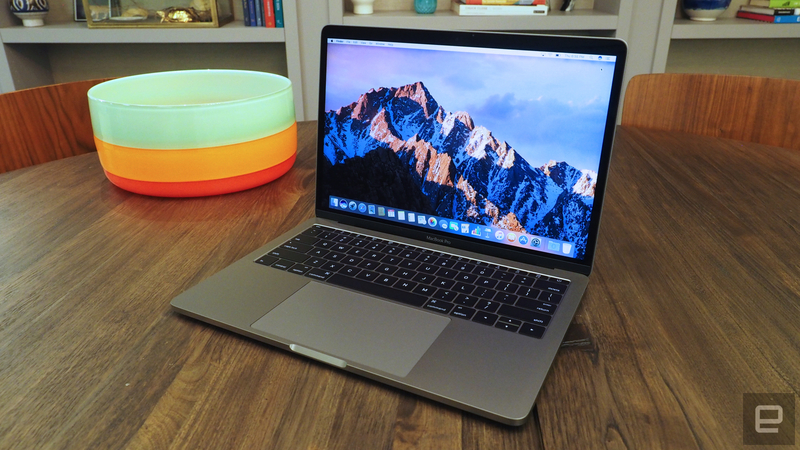 It's a likely upgrade choice for MacBook Air owners. As a refresher, the new Pro weighs the same as the Air, at about 3 pounds, but has a noticeably smaller footprint. It also has the Retina display you always wished you had on the Air. There are some other differences too, including a much larger touchpad, a redesigned keyboard and a new selection of ports: just two Thunderbolt connections and a headphone jack. Oh, and it has a new price: The 13-inch Pro starts at $1,499, a bit more than you would have hoped to pay for a refreshed Air. The laptop is shipping now and on display in Apple Stores, so there's nothing stopping you from getting hands-on today. For my part, I received my test unit yesterday evening, which means I am in no way ready to publish a full review. But I am ready to give you a first look. Join me. Let's start with the design: Holy moly, is this thing small. I noticed it right away, just because my normal work laptop is a MacBook Air, which means I'm used to something much larger than this. The difference is especially obvious if you stack one machine on top of the other. Though both have 13.3-inch screens, the new MacBook Pro has a much smaller footprint — it's shorter and narrower. Truly, trimming down that humongous bezel from the Air makes a world of difference. Just ask Dell, whose compact, 2.6-pound XPS 13 paved the way for laptops that take up shockingly little space. Basically, if you can achieve a nearly bezel-less screen, you can then squeeze it into a much smaller chassis than you would otherwise. The MacBook Pro also weighs about the same as the Air: 3.02 pounds versus 2.96. And that underscores another reason the Air should probably be given the ax. It was once a featherweight feat of engineering; now it's heavier than competing Windows machines (the XPS 13 being just one example), and it weighs the same as Apple's once-heavier Pro line. All that said, 3 pounds is still plenty portable, especially if you've bought MacBook Pros in the past and are used to toting around something heavier. For those of you who are upgrading, this will feel like an improvement. At 14.9mm thick, the Pro is also 12 percent thinner than the Air, though that's not quite as obvious because the Air has a wedge-shape design that gets narrower at the end. 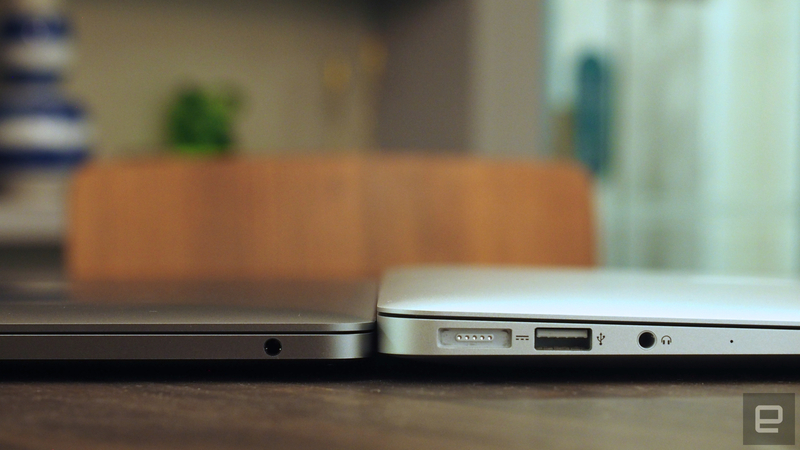 Thinner is generally good, so long as the battery life doesn't suffer. In this case, it also means thinner ports. (Though, let's face it, Apple likes to get rid of legacy ports, so it would have done that even on a thicker machine -- and did, on the 15-inch Pro.) Where there used to be several full-size USB connections and an HDMI socket you'll now find two Thunderbolt 3 ports, along with a headphone jack. 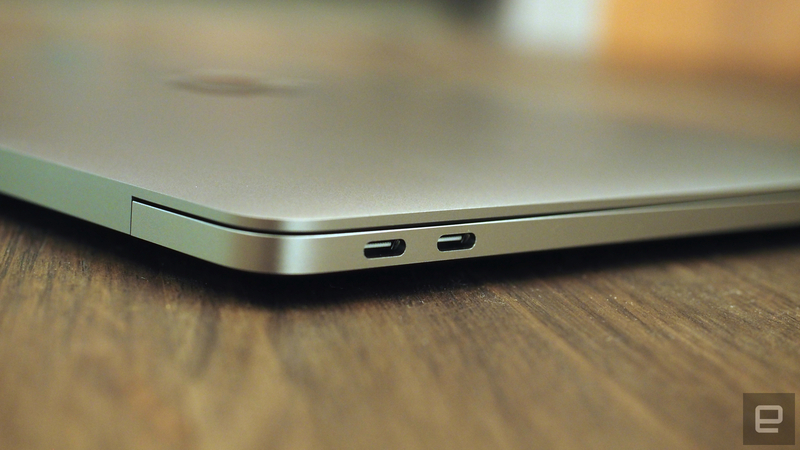 If you choose one of the higher-end MacBook Pros, you'll get four Thunderbolt ports. Either way, be prepared to un-learn some old habits. Gone is the MagSafe power adapter, though you can at least charge out of any Thunderbolt port now. You'll also need a dongle for any accessories requiring a full-size USB connection. Out of the box, you cannot charge your iPhone off this. 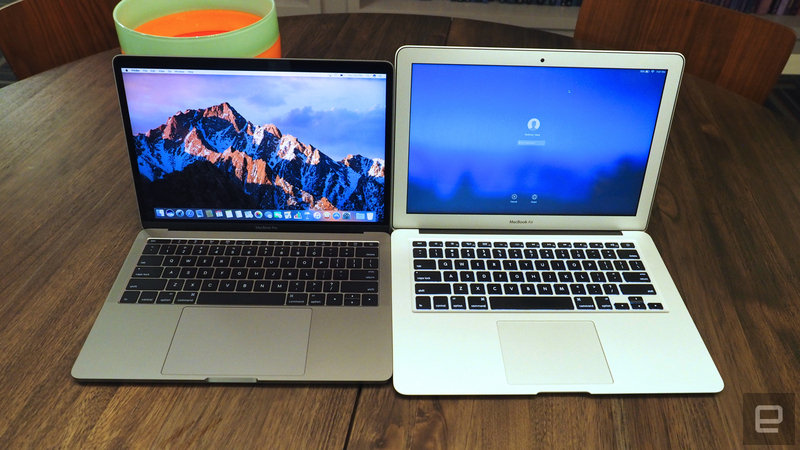 In many other ways, the MacBook Pro looks and feels similar to the previous generation. It's made of unibody aluminum, available in silver and space gray. Though the 500-nit display is 67 percent brighter than the previous-gen Retina panel, with 67 percent higher contrast and 25 percent more colors, the resolution is the same, at 2,560 x 1,600 (a pixel density of 227 ppi). It's lovely, especially with those tiny bezels and skinny metal frame around the screen. Particularly for those of you who have only ever owned the Air or an ancient MacBook Pro, you're in for a treat. The keyboard is both the same as before, and also not the same. As I said, this is the version of the MacBook Pro that does not have the OLED touchscreen stretching above the keyboard. That means the physical Escape key has lived to see another day — as have all the other Function keys, including brightness and volume controls. So the keyboard looks the same. But then you touch it. 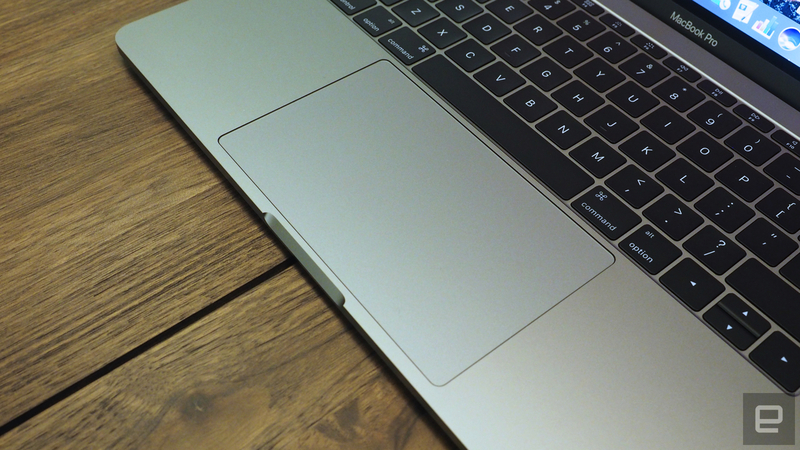 Under the keycaps, Apple went with the same "butterfly" mechanism that it introduced on the 12-inch MacBook. That means these buttons are shallower and less pillowy than on the last-gen MBPs but still manage to be a lot springier than they look. I felt a little sour at first, giving up my old keyboard design (I don't love change), but so far I'm typing away at this very story, and I'm not making many typos, either. As for the Force Touch trackpad, it's 46 percent larger than before, making it nearly as big as Apple's Magic Trackpad accessory. It's more than enough space for the basics — stuff like scrolling and pinching to zoom. I'll be curious, too, to see how it fares in more professional-grade use cases, like video and photo editing. More on that some other day. There's a reason I'm not calling this a review. There's so much I haven't had time to test! Apple says the battery life on both the 13- and 15-inch MacBook Pros can reach 10 hours. I'll be sure to investigate that claim. Apple also stepped up to sixth-gen Intel Core processors across its lineup, with faster solid-state drives promising read speeds of up to 3.1 gigabytes per second. Oh, and I specifically didn't mention the speakers earlier, either. I'd like to listen to my very large, and very eclectic, Spotify collection before weighing in on the audio quality. Given that the Pro has always been aimed at power users — and has a starting price to match — I don't want to give the performance short shrift. And benchmarks are just the beginning too; real-world use matters as well. So give me a few days to live with this thing and I'll be back soon with a full review. In the meantime, what's the over/under on how long Apple waits before killing off the 13-inch Air?